For Muslims, eating right means more than simply a balanced diet; it is a sacred law of their religion that they dutifully abide by. Halal -- roughly translated into “permissible” from Arabic -- food refers to that which is permitted for consumption in Islam. Haram, or “forbidden,” foods are those that Muslims must stay away from, such as alcohol and certain types of meat, notably pork and dog meat. Keeping halal is considered a sacred duty to Muslims who abide by it. And that is a surprisingly tall order in Korea, where the Muslim population is estimated to be around 130,000 to 140,000. Muslims living and visiting Korea have expressed difficulties in finding the right places to dine. Hussain said one of the most common misunderstandings about Muslims among Koreans is that they are all vegetarians, a misunderstanding that stems from Muslims opting to follow a vegetarian diet here due to difficulties in finding halal food. “The first Korean sentence we (Muslims) learn is ‘No meat, please,’” he said. Halal does not refer to just the right type of food, but also the manner in which it is prepared. Cross-contamination between halal and haram food can be a big problem for Muslims, meaning a cook cannot use the same knife, same storage, same cutting board or any other equipment for both halal and haram food. Furthermore, true halal food must be prepared by a Muslim chef, and animals must be butchered in a prescribed manner. “When we follow something about halal, we follow what is mentioned in the Holy Quran,” explained Bahzad Mohammad Barafi, executive oriental chef at Madinat Jumeirah in the United Arab Emirates. He noted that in many cases people are confused about what is and is not halal. “In places like Dubai, they have pork for specific restaurants so they don’t get mixed. Even before people enter a restaurant, they would know whether it is one serving pork or not. They have separate rooms, separate cutlery, separate ingredients, separate dishwashing machines,” he said. Mohammad was in Korea to explain to Korean food professionals what halal food. He emphasized that such food is not something special. “You just need the right ingredients,” he said. 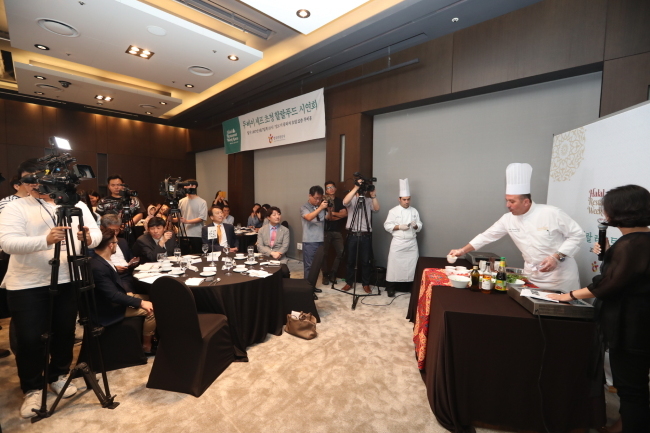 He demonstrated the preparation of halal food at The Plaza Hotel in Seoul on Thursday as part of the Korea Tourism Organization’s Halal Restaurant Week being held September and October. 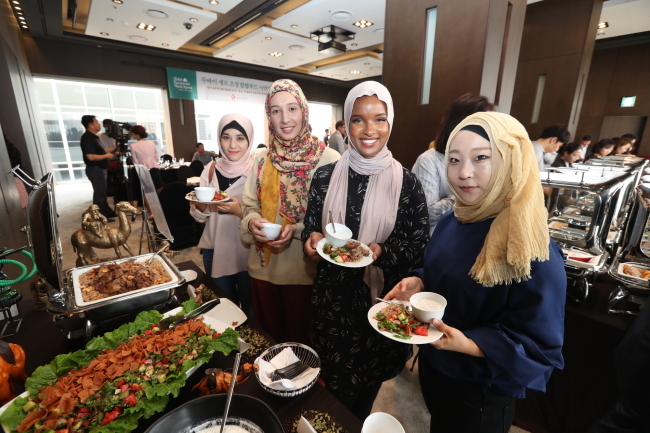 The event is aimed at promoting the 107 KTO-certified Muslim-friendly restaurants across the country. The certified restaurants are categorized into those that are halal-certified by the Korea Muslim Federation, those that are self-certified by the owners and cooks as being Muslim and using exclusively halal ingredients, those that sell halal food but also sell alcohol, and those that are free of pork. The tourism agency is pushing to attract more Muslims tourists to the country, as Chinese tourists are dwindling in number. In 2016, 980,000 Muslim tourists visited Korea, a jump from 740,000 the year before. Im Gyeong-suk, the owner of Muree Muslim Food in Itaewon-dong, Seoul, said interest in halal food spiked around three to four years ago when former President Park Geun-hye emphasized the importance of the Arab market. Despite ongoing efforts, she said halal awareness could be improved in Korea. Chef Mohammad had such an experience during an earlier visit to a Korean restaurant. He asked if they served halal food, to which the answer was yes. But when he saw the menu, he saw that they also served pork. As storing both pork and halal food is prohibited, it was not actually halal. “Haram is haram. To say ‘a little of haram is OK’ is not OK. No matter how small something is, you are already in the haram,” he said. Im also took issue with guidebooks published by the authorities here, including “Muslim Friendly Restaurants in Korea” in 2015, authored by the KTO. She said the recommended Korean items included ingredients that were not halal. While the menu items may have been free from any halal food, it is customary in Korea to include a little bit of alcohol to enhance the smell when preparing dishes like spicy seafood soup and braised seafood. Such explanation is absent in the guidebooks, leaving readers oblivious to the possible danger of violating their religious code. “They have no idea how picky Muslims are when eating their food. If they do it like this, what faith will they (Muslims) have in the halal mark in Korea?” she said. Hussain, who has lived in Korea for nearly 10 years, said the most important thing is for Koreans to respect Muslim culture more.